An exhibition comes to Hypatia! Mother and Child is a special temporary installation of ceramic sculpture inspired by the work of Henry Moore. Diana was very much inspired by his work and interviewed him on one afternoon in February 1978. Notes made from the meeting have been added to The Henry Moore Foundation archive and will also be displayed with the work. Come and view the work during the day from 10-5pm, and meet Diana at the finissage event in the evening from 5-8pm. From Monday 13th May - Friday 14th June pieces of sculpture from the installation will still be on view at the Hypatia base in Chapel Street, but please note the premises are not staffed full-time. Do contact us if you’d like to be sure of a viewing and we can make arrangements. As part of the Cultivator-funded series of creative network events at the Hypatia Trust, Alexandra will present: 'Bad endings and the afterlives of Greenham Common'. The talk is free and refreshments will be provided! Do book a place via Eventbrite if you can as this gives us an idea of how many people to expect. This talk begins by reconsidering the unsatisfactory conclusion of a published article by the speaker on the strategic mobilisation of the maternal - and maternal mourning in particular - as a defence against the 'pantoclastic' threat of nuclear world war. Kokoli's reflection on the mobilisation of mourning and mother-and-child iconographies in the visual and material cultures of the peace camp at Greenham Common ended with an anti-authoritarian reclamation of failure as an antidote to war-bound triumphalism in the writings on Virginia Woolf and Jacqueline Rose. Beyond psychoanalytic theory and feminist anti-war discourse, however, failure is evoked all too often in assessments of the legacies of the women's peace camp at Greenham Common and similar occupations and activist initiatives. Such assessments of Greenham Common's successes and failures will be revisited in order to reframe and complicated them: in addition to questioning the meaning of 'failure' in pacifist contexts, I propose new understandings of Greenham and its legacies as an alternative uncanny dwelling; a durational performative artwork; and a school for art and activism. About Alexandra: Dr. Alexandra Kokoli is Senior Lecturer in Visual Culture at Middlesex University London and Research Associate at VIAD, University of Johannesburg. An art historian and theorist originally trained in comparative literature, Kokoli researches the aesthetic mobilisation of discomfort to political ends, focusing on art practices informed by and committed to feminism, the fraught but fertile relationship between feminism and psychoanalysis, mourning and shame. She curated ‘Burnt Breakfast’ and other works by Su Richardson (Goldsmiths, 2012) and, with Basia Sliwinska, Home Strike (l'étrangère, 2018), and has published widely on feminism, art and visual culture in journals including Art Journal, Women and Performance, n.paradoxa, Performance Research, Oxford Art Journal and Hypatia. Her books include The Feminist Uncanny in Theory and Art Practice (2016); and (as editor) Feminism Reframed: Reflections on Art and Difference (2008); and The Provisional Texture of Reality: Selected Talks and Texts by Susan Hiller, 1977-2007 (2008). Kokoli is currently researching the legacies of the women's peace camp at Greenham Common and, more broadly, the aesthetics and politics of feminist anti-nuclear activism. Doors open 7pm, Thursday 28th February. Talk starts at 7.30pm. Free places can be booked here. As part of the Cultivator funded creative network series, Dominica Williamson will take us on an interactive plant journey that starts with a look at the Hypatia Trust archives and the Eden Project Florilegium Society. She will then focus on how she is slowly drawing and modelling ecosystems through studying and creating traditional botanical plates, and by looking at plants that are indigenous and non-indigenous through the sciences, and through embedded knowledge and people’s feelings. Dominica is an artist working in the field of interdisciplinary design and sustainability and new materialism. After completing a Leverhulme Artist in Residence with the University of Plymouth, her practice around plants has blossomed. She has co-worked with scientists and communities on a Global Challenges Research Fund during which Mangrove forests became integral to the project. Currently she is co-creating landscape-based work on a pan European cultural project called Ruritage. Feminist readings, networking and cake! Thanks to Cultivator we’re delighted to be able to host this free event at the end of this month. To be assured of a place please register a place on Eventbrite. The Feminist Duration Reading Group was set up in London in 2015 to explore lesser-known feminist texts from outside the Anglo-American feminist tradition, combining this with discussions of current feminist issues and urgencies. On their visit to Hypatia, Giulia Antonioli, Sabrina Fuller, and Helena Reckitt of the FDRG will share texts and inspiration from black feminist writings, Italy and Indonesia. No advance reading is required as we will read texts out loud together and then discuss. 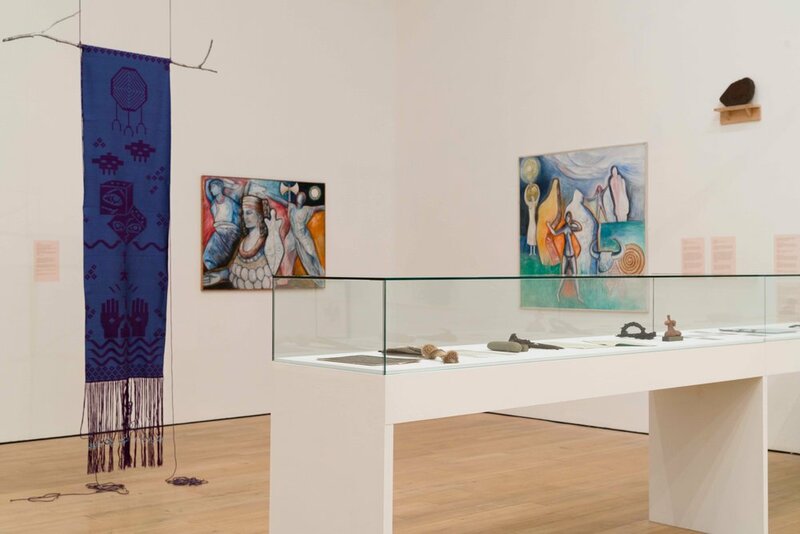 The Feminist Duration Reading Group welcomes everyone to explore the feminist legacy and its resonance in art, thinking and collective practice. If there are enough people who are interested in forming a local reading group we may also discuss the viability of this. Details about The Feminist Duration Reading Group, London can be found here. Milan Women’s Bookshop Collective, The Practice of Doing, in Sexual Difference: A Theory of Social- Symbolic Practice, trans. Patricia Cicogna and Teresa de Lauretis, Bloomington and Indianapolis: Indiana University Press, 1987. Hazel V Carby, White Woman Listen! Black Feminism and the Boundaries of Sisterhood, in The Empire Strikes Back: Race and Racism in Seventies Britain, edited by the Birmingham Centre for Contemporary Cultural Studies, 1982. Khairani Barokka, ‘Moon Dances with Three Planets,’ ‘Eve and Mary Are Having Coffee,’ and ‘Coffee Monologues,’ (excerpts from solo spoken word/art show Eve and Mary Are Having Coffee) in Poems and other myths: a collection of spoken word poetry by women from Asia, Big Bridge Press, 2016. This free event is for anyone curious about book arts, hoping to try their hand at making, bookbinding, already engaged in the creating of, or wishing to help nurture activities in support of book artists. 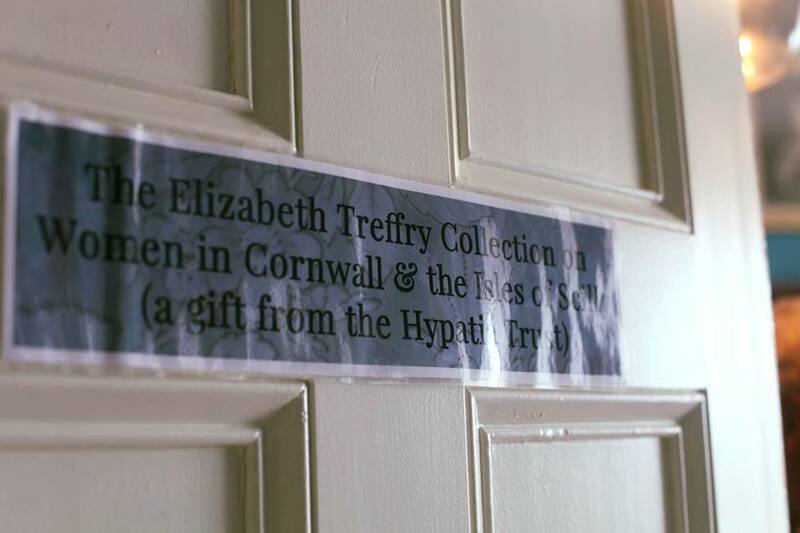 The evening’s conversation will include a presentation of the book art piece, ‘Kernow Foremothers: A Homage to the Ferris Women of St. Agnes, Cornwall’, being given to the Hypatia Trust for its collection. Rounding off the evening, she will give a brief history of the origin and progress of the Puget Sound Book Artists organisation – and share encouragement for the activities and efforts of the book arts community in Cornwall. A short Q & A may follow. A handout of useful information and links will also be available. About Patricia: Patricia Chupa is now retired from a varied working life as a teacher, bookseller, and senior library circulation supervisor. Over the last 10 years, her work has been in exhibitions in Tacoma and Olympia, WA; Dallas, TX; Bristol and Cornwall, UK, Blissfully, she is now able to devote much more time to the making of book art and bookbinding. She has been at it now for over 28 years. An intense 4 session course with further creative writing writing exercises and discussion to strengthen description, atmosphere and imagery. See this short introductory video to introduce the course, and contact Linda Cleary: freewriterscentre@gmail.com for booking and information. 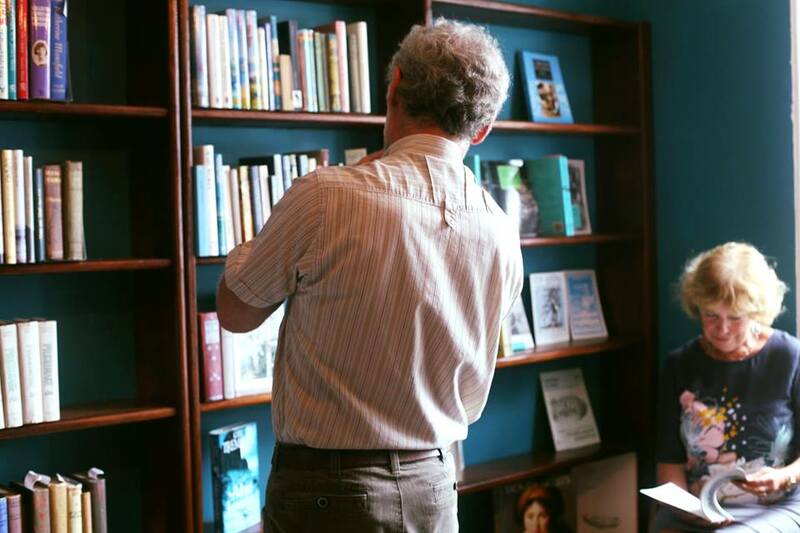 This free event celebrates Bristol Art Library's 20th anniversary. Head librarian artist Annabel Other is delighted to be bringing the library to The Hypatia Trust. A performance event - pop in and interact with this fully functioning public library housed in a wooden cabinet the size of a small suitcase. The library’s volumes cover a wide range of subjects, from palaeontology to astronomy, with 250 books made by artists and practitioners from all areas of the arts and sciences. The library will be at Tate St Ives the day before it comes to Hypatia in Penzance and new publications will be collected in Cornwall along the way - including an edition by artist Abigail Reynolds. Membership of Bristol Art Library is free, and once you have joined and received your manilla reader’s ticket you may visit the library and peruse its volumes anywhere in the world. The library now has 1200 members, a gift shop and a friends’ organisation FOTBAL (Friends of The Bristol Art Library). Pop in and join in the fun on Saturday 3rd November anytime between 2-4pm. We recommend you sign up for a free ticket through eventbrite - though just come along if not! Another fabulous fundraising event coming up in aid of The Gardeners’ House project! 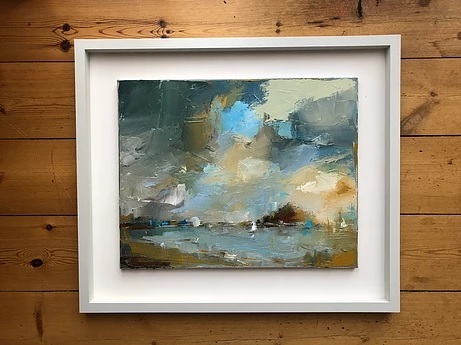 On the 1st November is the Art & Taste Charity Auction, with paintings, drawings, ceramics, jewellery, cinema and restaurant offers all up for grabs. The auction will take place at The Union Hotel, Chapel Street, at 6.30pm, and promises to be a really fun evening with some amazing things on offer from generous local artists and businesses. Have a look at what you could bid on! Viewing will begin on the day at 4.30pm. Plenty more to follow in support of the project, so keep an eye out for more events this autumn. On Sunday, 14th October 2018 Maria Adams is competing in Cornwall’s biggest running event, the Eden Marathon and Half Marathon - a multi-terrain route through the spectacular Cornish countryside. She'll be tackling this challenging hilly multi-terrain course to raise funds for The Gardeners' House project, our mission to build a new botanical education centre in Penzance. Best of luck to Maria and her training!! We have a new date for Bryony Gillard’s presentation! In partnership with the Exchange Gallery, Penzance, Hypatia artist Bryony Gillard will explore the relationships between art and literature, peripheral landscapes, female experience, and creativity, drawing on the writings of the Modernist poet, and Isle of Scilly resident, H.D. Bryony will talk about her recent moving image work, A cap like water, transparent, fluid yet with definite body (2018), recently presented at Tate St.Ives in Virginia Woolf: An exhibition inspired by her writings. The event will also include a screening of the film. Bryony Gillard’s practice is situated between writing and art practices that draw on the notion of ‘constant revision’, and states of being in which structures or ideas can be subverted, dissolved or questioned. Her work often focuses on marginalised Herstories and practices — addressing historic imbalances and reflecting upon practices, approaches and ideas that refuse to be pinned down or categorised. October 13th, 2-4pm at the Hypatia Trust. More information about this event here.